Doing It By The Book At York Survey! After nearly 40 years, our customers have increasingly turned to our website, www.YorkSurvey.co.uk, as an integral step in their purchase cycle. The convenience of online browsing through all of our products and the ability to quickly compare prices and brands on offer have fostered a highly practical way of sourcing and getting the best surveying tool for the job in hand. Alongside our website we still offer a hard copy of our 300 page Product Guide & Price List catalogue showing over 6,000 products with detailed photos and a clear description allowing a buying decision to be made. The ideal medium for quickly scanning through and comparing products at the office or in the field. Make sure that you have our 2019 edition by picking one up from our showroom or by clicking on this link - it will be in the post today. Remember, most items are held in stock for next day delivery! YSSC Can Now Be Found On Your Favourite Social Media Sites! There are now even more ways to stay in touch with York Survey Supply Centre! Keep yourself right up to date with all York Survey's latest news, new product launches and exclusive special offers by following us on Facebook, Twitter and Instagram. York Survey Supply Centre has over thirty-five years experience and is now the leading manufacturer and supplier of quality survey equipment, markers and accessories in the UK. We are a mail order company supplying the surveying and construction industry with a unique range of over 6,000 products all manufactured and marketed to provide the highest quality at the most competitive prices possible. 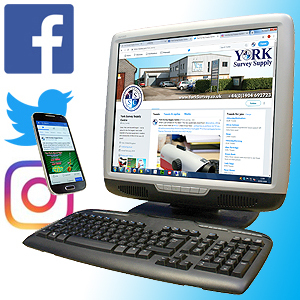 We can be found on Facebook by searching for "York Survey Supply Centre" or on Twitter and Instagram under the name, @York_Survey - alternatively, there are direct links available from our website! 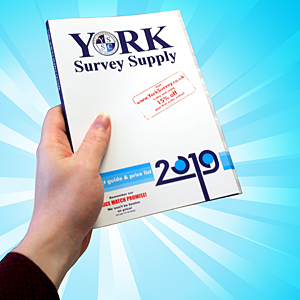 Have You Got Your Hands On The Latest York Survey Catalogue? 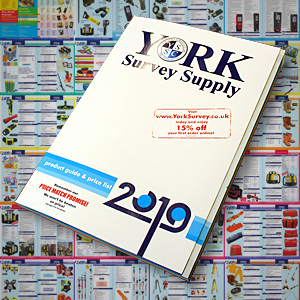 York Survey Supply Centre's 2019 catalogue is out now, full of the very latest exciting new releases! "Our new look catalogue remains your single source reference for the greatest selection of surveying equipment and accessories around," says Stuart Rawlings, York Survey's Managing Director, "all available to order, from our fully stocked warehouse, for next day delivery anywhere in the UK!" "As always, you'll find everything from the simplest survey nails to advanced total stations. The new book is full of all your old favourites plus many exciting new product launches, such as the latest Leica DISTO™ laser distancemeters, all available from stock!" "And don't forget that you can see all these products in our showroom, Prospect House," continues Stuart, "Situated on George Cayley Drive - along with our main office and distribution centre - our spacious new showroom, carrying a much broader range of stock, is staffed by members of our knowledgeable sales team, ready to deal with your queries!" Additional copies of the new catalogue can be ordered via York Survey's website, www.YorkSurvey.co.uk, or you can view it live online. Alternatively, you can give your details to their sales team - who will also be happy to assist you with any orders and product queries - on +44 (0)1904 692723. Customers on our website can take early advantage of our fantastic January Sale savings! 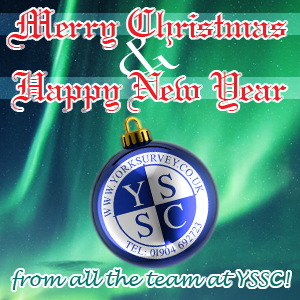 York Survey closed for the Christmas holidays at 5:00pm on the 21st December and will be back and open for business as usual at 8:00am on the 2nd January. However, you can continue to place orders via the website or fax throughout the festive period for action when we return in new year. Since those orders will be dispatched during our January Sale they'll be eligible for the 20% discount and as such you'll find that our website is already taking this into account. 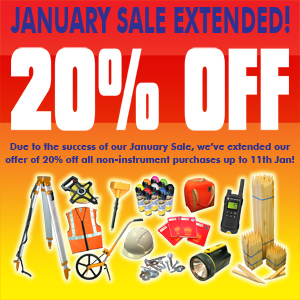 *20% discount applies to non-instrument purchases only. Website orders will be processed January 2nd for delivery on January 3rd. Next day delivery applies to UK only. Free delivery on orders over £200 net. Please allow 2-3 days for Northern Ireland and certain remote and offshore locations. But we will still be busy in the days before that! York Survey will be dispatching your orders right up until 4:00pm on the 21st December so that you have your equipment ready for immediate start in the new year! Of course, you can also continue to place orders via the website or fax throughout the Christmas holiday for action when we return in January. In the Clear at York Survey Supply Centre! With the publishing of their latest catalogue and the arrival of many new products, York Survey find that they still have the last few items of discontinued lines to dispose of so, if you're looking for an inexpensive option when choosing your latest piece of surveying equipment, you can always check out the end-of-line products in the clearance area of their website. 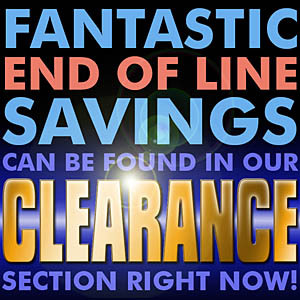 "The clearance section is where we put all our end-of-line stock and where you can pick up a bargain!" says Jan Cammidge, a member of the York Survey sales team, "The area is constantly being updated as we refresh our stock of new and innovative products so it's worth your while to visit regularly and see what you can pick up." "As if our usual list prices of up to 35% off the MRP weren't already enough," she continues, "products moved to the clearance area are reduced still further - there are some amazing savings to be found!" "Don't forget, these are all limited offers so grab what you can while stocks last - once they're gone, they're gone!"